A beautiful girl, a cruel step mother, two ugly step sisters, a fairy god mother. You know the story....or do you? Cindy-ella is the classic fairytale - but with a hilarious twist. Will the fairy god mother remember her magic words? Will the ugly sisters follow their dream of being fashion models? Who will end up marrying the prince? And will Cindy-ella ever find her shoe? 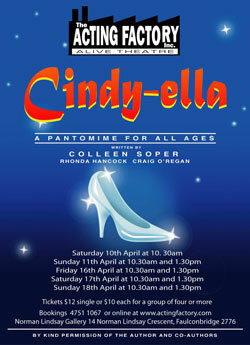 Cindy-ella is an interactive show that involves singing, dancing and lots of audience participation and is guaranteed to entertain both children and adults alike.